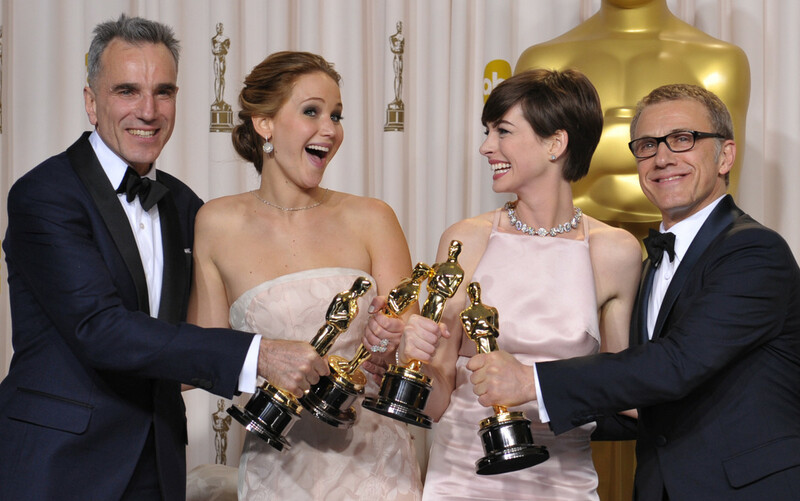 A list of Oscar Winners from the 2013 Academy Awards, courtesy of THE ASSOCIATED PRESS. 1. Supporting Actor: Christoph Waltz, "Django Unchained." 2. Animated Short Film: "Paperman." 3. Animated Feature Film: "Brave." 4. Cinematography: "Life of Pi." 5. Visual Effects: "Life of Pi." 7. Makeup and Hairstyling: "Les Miserables." 8. Live Action Short Film: "Curfew." 9. Documentary (short subject): "Inocente." 10. Documentary: "Searching For Sugar Man." 11. Foreign Language Film: "Amour." 12. Sound Mixing: "Les Miserables." 13. Sound Editing (TIE): "Skyfall," "Zero Dark Thirty." 14. Supporting Actress: Anne Hathaway, "Les Miserables." 17. Score: "Life of Pi." 19. Adapted Screenplay: Chris Terrio, "Argo." 20. Original Screenplay: Quentin Tarantino, "Django Unchained." 21. Director: Ang Lee, "Life of Pi." 22. Actress: Jennifer Lawrence, "Silver Linings Playbook." 23. Actor: Daniel Day-Lewis, "Lincoln."